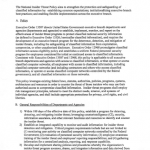 The National Insider Threat Policy aims to strengthen the protection and safeguarding of classified information by: establishing common expectations; institutionalizing executive branch best practices; and enabling flexible implementation across the executive branch. A facilitated brainstorming session was convened to identify and examine the most common misconceptions about conventional Homeland plotting. These misconceptions stemmed from inquiries received from Federal, state, local, tribal, and private-sector consumers and from articles published by outside experts and in the media. Analysts identified the following six misconceptions as the most common and compared them with current analytic lines. A 2009 document from the Office of the Director of National Intelligence and the Department of Defense creating performance standards for “successful” and “outstanding” employee performance within the U.S. intelligence community. Urban Explorers (UE)—hobbyists who seek illicit access to transportation and industrial facilities in urban areas—frequently post photographs, video footage, and diagrams on line that could be used by terrorists to remotely identify and surveil potential targets. Advanced navigation and mapping technologies, including three dimensional modeling and geo-tagging, could aid terrorists in pinpointing locations in dense urban environments. Any suspicious UE activity should be reported to the nearest State and Major Area Fusion Center and to the local FBI Joint Terrorism Task Force. IARPA invests in high-risk, high-payoff research that has the potential to provide our nation with an overwhelming intelligence advantage over future adversaries. This research is parsed among three Offices: Smart Collection, Incisive Analysis, and Safe & Secure Operations. This BAA solicits abstracts/proposals for the Office of Incisive Analysis (IA). This Intelligence Community (IC) Technical Specification sets forth the physical and technical security specifications and best practices for meeting standards of Intelligence Community Standard (ICS) 705-1 (Physical and Technical Standards for Sensitive Compartmented Information Facilities). When the technical specifications herein are applied to new construction and renovations of Sensitive Compartmented Information Facilities (SCIFs), they shall satisfy the standards outlined in ICS 705-1 to enable uniform and reciprocal use across all IC elements and to assure information sharing to the greatest extent possible. This document is the implementing specification for Intelligence Community Directive (ICD) 705, Physical and Technical Security Standards for Sensitive Compartmented Information Facilities (ICS-705-1) and Standards for Accreditation and Reciprocal Use of Sensitive Compartmented Information Facilities (ICS-705-2) and supersedes Director of Central Intelligence Directive (DCID) 6/9. An Open Source Center translation of a decree issued by Hamid Karzai in July 2012 on fighting corruption in Afghanistan. Some homegrown violent extremists (HVE) have targeted US law-enforcement entities and have used publicly available information to counter these entities’ CT tactics and security practices. Law-enforcement entities are being identified by these extremists as both strategic targets and targets of opportunity, mainly because a core element of HVE subculture perceives that persecution by US law enforcement reflects the West’s inherent aggression toward Islam, which reinforces the violent opposition by HVEs to law enforcement. An autonomous or federal Kurdistan within Syria — similar to that which exists in Iraq — is unlikely because of intra-Kurdish conflict and the opposition of Turkey and the Syrian National Council (SNC) — the main external Syrian opposition group. Understanding master narratives can be the difference between analytic anticipation and unwanted surprise, as well as the difference between communications successes and messaging gaffes. Master narratives are the historically grounded stories that reflect a community’s identity and experiences, or explain its hopes, aspirations, and concerns. These narratives help groups understand who they are and where they come from, and how to make sense of unfolding developments around them. As they do in all countries, effective communicators in Syria invoke master narratives in order to move audiences in a preferred direction. Syrian influencers rely on their native familiarity with these master narratives to use them effectively. This task is considerably more challenging for US communicators and analysts because they must place themselves in the mindset of foreign audiences who believe stories that — from an American vantage point — may appear surprising, conspiratorial, or even outlandish. This report is focused on helping US communicators and analysts better identify opportunities to undermine AQ messaging. With this in mind, the report analyzes how AQ portrays itself and its objectives to the public through statements and multimedia releases – the messaging used to attract recruits, build public sympathy, and undermine adversaries such as the United States. Research for this analysis included AQ messaging dating back to 2000, with particular attention paid to recent messaging from 2009-2011. In addition to primary sources and open source research, interviews with 25 SMEs were used to surface master narratives, test hypotheses, and validate assertions. These SMEs were asked a combination of expansive, open-ended questions designed to surface new hypotheses as well as targeted questions designed to verify assertions. Combining these interviews with open source research, this report highlights how each master narrative reflects perceived history, themes, and objectives that are central to AQ’s public identity. Each of these master narratives appear with varied frequency across AQ messaging and propaganda, and collectively they represent a unified narrative system used by AQ and affiliate communicators. This report serves as a resource for addressing this challenge in two ways. First, it surfaces a set of nine master narratives carefully selected based on their potency in the context of France’s Muslim communities, and their relevance to US strategic interests. Second, this report follows a consistent structure for articulating these narratives and explicitly identifies initial implications for US communicators and analysts. The set outlined here is not exhaustive: these nine master narratives represent a first step that communicators and analysts can efficiently apply to the specific messaging need or analytic question at hand. For seasoned experts on French Muslim communities, these narratives will already be familiar — the content contained in this report can be used to help check assumptions, surface tacit knowledge, and aid customer communications. For newcomers to European Islam accounts, these narratives offer deep insights into the stories and perceptions that shape French Muslim identity and worldviews that may otherwise take years to accumulate. Understanding master narratives can be the difference between analytic anticipation and unwanted surprise, as well as the difference between communications successes and messaging gaffes. Master narratives are the historically grounded stories that reflect a community’s identity and experiences, or explain its hopes, aspirations, and concerns. These narratives help groups understand who they are and where they come from, and how to make sense of unfolding developments around them. As they do in all countries, effective communicators in Somalia invoke master narratives in order to move audiences in a preferred direction. Somali influencers rely on their native familiarity with these master narratives to use them effectively. This task is considerably more challenging for US communicators and analysts because they must place themselves in the mindset of foreign audiences who believe stories that — from an American vantage point — may appear surprising, conspiratorial, or even outlandish. North Korea’s recent threat to carry out “special actions” against the South is rare and seems intended to signal the regime’s resolve to move forward with some form of provocation. The threat, however, is unlike past warnings the regime has typically issued prior to military provocations, suggesting that the North might follow through with a move other than a conventional military attack. Significantly, some aspects of the warning appear to signal Pyongyang’s commitment to follow up on the “actions” in the near future. Pyongyang quickly has set the stage for the fourth Party Representatives Conference slated for 11 April. Though state media have not yet announced an agenda for the conference, it is likely that the regime will use the event to memorialize formally Kim Jong Il and appoint Kim Jong Un to a top party post. The tables below provide a baseline of state media coverage of the impending conference and its antecedents. Personnel moves at the recent Party Conference and spring session of the legislature — beyond Kim Jong Un’s assumption of the top slots — underscore the new leadership’s continued commitment to revitalizing the Party as an institution and its confidence in managing the system. Though state media billed the moves merely as filling vacancies, the leadership quietly elevated or replaced almost one-third of the ruling Political Bureau, many through unannounced retirements or dismissals. The personnel changes occurred in military, internal security, and economic organizations and are not clustered in one area. Though personnel were added to the National Defense Commission (NDC), its relationship to the Political Bureau and Central Military Commission (CMC) remains unclear. OSC has identified more than 350 joint ventures in North Korea in a search of open source information. For the 88 ventures for which we have investment amount data, the aggregate total of reported foreign investment from 2004 to 2011 amounted to $2.32 billion, with roughly half of that going toward ventures in the mining sector. Firms from China account for 75% of the joint venture partners for which partner country is known, followed by firms from South Korea, Japan, and Europe. Of the joint ventures for which we found location information, most show a Pyongyang address. The remaining are concentrated at seven locales in other parts of the country. Conflict between government and opposition forces continued during the week, generally following the established pattern of government military attacks and security raids against centers of opposition, on the one hand, and ambushes and bombings by opposition forces on the other. The Syrian conflict also continued to spark clashes in neighboring Lebanon. Further turmoil among the top leadership of the opposition Syrian National Council (SNC) reflected the opposition’s continued difficulty in unifying ranks. Syria and the United Nations traded accusations on the subject of human-rights violations. OSC has recently observed two Facebook pages and a popular blog that promote the recently established Syrian jihadist group Al-Nusrah Front and jihadist attacks in Syria. As these pages are the top results for a Google search in Arabic of “Al-Nusrah Front,” they are likely to be visited by Arabic-speaking Internet users interested in the group. Observed activity on these pages suggests expanding interest in Al-Nusrah Front. Despite past denials by Tehrik-e-Taliban Pakistan (TTP) leaders that the group intends to target Pakistan’s nuclear weapons, TTP Mohmand Agency leader Omar Khalid said in a 21 March video that the TTP aims to use Pakistan’s nuclear technology, among other assets, to ensure Islam’s survival. This is the first time that OSC has observed a TTP leader publicly list Pakistan’s nuclear weapons among its goals. Other elements of Khalid’s statement suggest that he may be seeking to boost his own stature within the group. Open source reporting indicates the Afghan political landscape, presently dominated by four political groupings and a number of prominent politicians, is likely to undergo further changes in the lead-up to the presidential elections and withdrawal of ISAF forces in 2014. Differing views of the Taliban threat as ISAF withdraws is likely to help drive the realignment and consolidation of political forces. This realignment may result in two major groupings: President Hamid Karzai and allies keen on working with the Taliban versus former anti-Taliban forces and others opposed to the government’s alleged appeasement toward the militants. Such consolidation would likely lead the emerging generation of younger leaders to choose between joining one of the groupings or risk being marginalized at the national level. Four main political groupings — Karzai’s camp, the National Front of Afghanistan (NFA), the National Coalition of Afghanistan (NCA), and the Truth and Justice Party (TJP) — are currently dominating the Afghan political scene. Catalyst, a component of DDNI/A’s Analytical Transformation Program, will process unstructured, semistructured, and structured data to produce a knowledge base of entities (people, organizations, places, events, …) with associated attributes and the relationships among them. It will perform functions such as entity extraction, relationship extraction, semantic integration, persistent storage of entities, disambiguation, and related functions (these are defined in the body of the report). The objective of this study is to assess the state-of-the-art and state-of-the-practice in these areas. Presentation on Knowledge Assertions and Knowledge Organization Systems from the Office of the Director of National Intelligence, Chief Information Officer dated July 16, 2009.